One of my stamp lines in this release is created directly from my own watercolor paintings. These were so fun to create, and there are many possibilities in working with them. 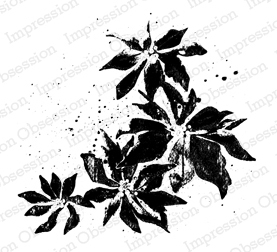 They can be stamped as is, inked and misted for a faux-watercolor look, or stamped and blended with water or alcohol for a variety of effects. They can be further embellished, as I've shown below. I'll be working on some floral designs for spring, and I'm also working on a video tutorial for using the stamps that I'll share in a DT Thursday post August 22nd. I've really had fun working with them! On this card, I stamped the Holly image in dye ink, sponged around the stamped area, then colored in the berries with a pencil, and added highlights with acrylic paint. On this card, I stamped the Oak Leaves over an acrylic paint background using Colorbox Fluid Chalk ink, then blended with alcohol. On this third card, I painted the base with acrylic paints, stamped the Poinsettias with Colorbox ink, then added in the flower centers with silver and white acrylic paint. I used CAC French Text in the background. Dina these are beautiful! I especially love the holly and berries which look fabulous highlighted with white. Of the 3 I think I like the 1st the best. Love the background, but mostly I love the sentiment. But the second one has lovely fall colors...Well as usual, I think I've nailed down a fav. Only to find out I haven't! Thanks for sharing your talent with us, and thanks for the chance to win. Gorgeous cards..would be hard to pick a favorite. Gorgeous card designs Dina. I love the 'watercolour' images. I have to say that they were my favourites out of the new releases. All 3 cards are GORGEOUS! 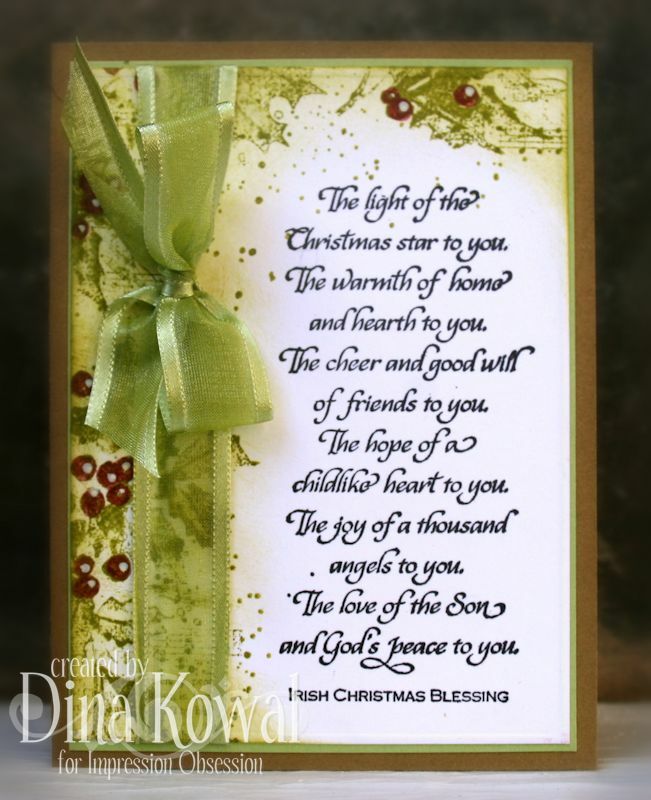 Love the holly stamp, the poinsettia stamp and the music background. Wonderful cards using these stamps! Wow! I'm blown away by all of your cards today!!! I love them all. You do fabulous work. Wow...all three are beautiful pieces of art....each unique and different! I love your cards but that holly card just touched my heart. Thank you for such wonderful inspiration. Dina, your new stamps are fabulous! I and my bank account are in big trouble. Of course, your cards are wonderful...as usual. These are all gorgeous and the stamps so unique. Love how you used paints on these, the colors and textures are so rich! Wow, wow and wow!!! These cards are all gorgeous! Your technique combined with the beauty of the stamps is stunning. 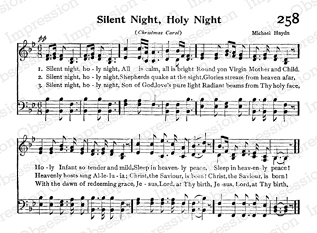 I especially love the holly card. We had a big holly tree in our back yard growing up. I love these new stamps! All 3 cards are beautiful too... I will be waiting for your video, I have never heard about alcohol and chalk ink together before! Wow! Absolutely stunning! I love the gorgeous Holly image! All three cards are beautiful. I am scrolling up and down your post to get 2nd and 3rd looks of these gorgeous cards! Gorgeous cards! 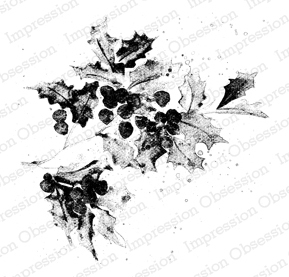 The holly and berries stamp, poinsettia, cluster of leaves are all just beautiful! What a great set of 3 cards. I had seen the sample leaf card on the IO website and wondered about it - it's gorgeous. I love all of your techniques, especially the Christmas card with the green ribbon. Thanks for sharing. Beautiful work. Your white bow is so perfect. I love the softness of the images. Beautiful cards. These are just so beautiful with all the color and texture! All of your cards are absolutely gorgeous!! Beautiful cards!!! Love the holly and the leaves the best!! Oh my! All of these cards are gorgeous, and to start with your original artwork is a beautiful way to stamp! Thank you for sharing your talent and inspiration! Holy smokes, Dina, three awesome cards. I really do not know which I like best. I really like how you did the holly with the ink and pencils. That second card has so very much texture and wonderful colors. I also adore the poinsettia card. So many different media. Fantastic. oh, wow, three gorgeous cards with some interesting techniques. the poinsettia has to be my favourite though. Dina, these are all so beautiful and elegant. I just love these new stamps. All of your cards today are so beautiful!! I love the Irish blessing with the holly. Thanks for telling us how you colored it, I often forget that you can layer different mediums of color. Thanks for sharing. These are all so beautiful with the large sentiment and all the details! Simply stunning. I love your combination of stamps and different mediums of color. Not to mention THAT BOW!!! My mother-in-law would love the Irish Christmas Blessing card. All your cards are exceptionally beautiful! All the cards are beautiful, I really like the Irish Blessing card. I love your cards! In fact when I took a very quick glance through the new stamps, these three watercolor images caught my eye right off. 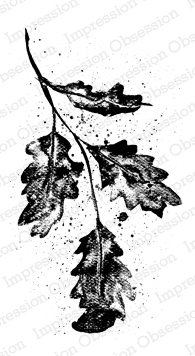 On the oak leaves card, you stamped on acrylic paint with chalk ink and blended with alcohol -- do you have more details on this technique? Oh Wow!Great cards!Beautiful!Love the sentiment on 1st one!!! you are amazing - beautiful cards! What a wonderful collection of stamps! 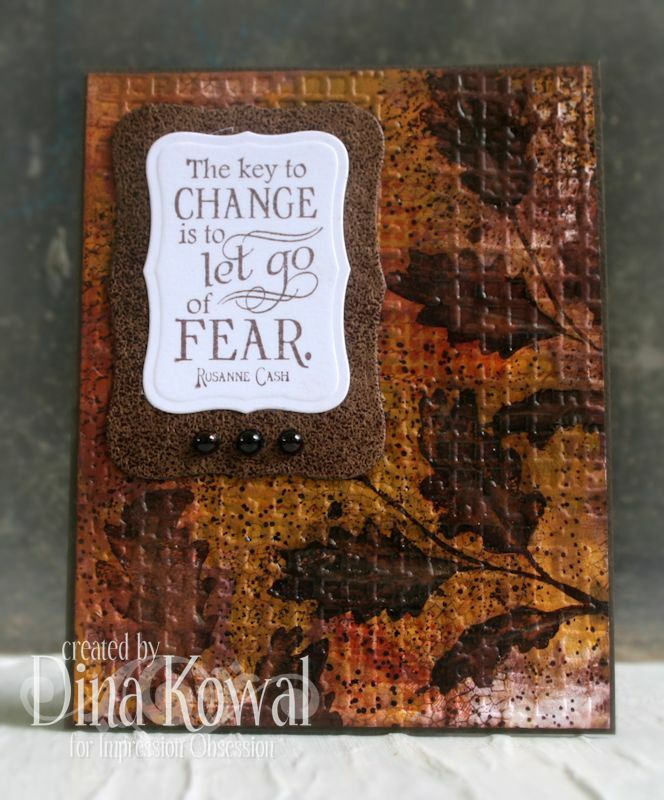 Just love your cards Dina - great colours, layers and textures. All your cards are pretty but the fall card just takes my breath away.